Since birth, babies are wired to explore the world through their five senses. As they grow, from smelling their first flower, to dipping their finger into ketchup and tasting it for the first time, to feeling the texture of laces when learning to tie their shoe, everything is a learning experience for little toddlers. Such sensory exploration helps children better understand their surroundings as they become increasingly aware of the great big world. A great way to encourage sensory exploration is through sensory play. And what child doesn’t like to play? Sensory play is any activity that stimulates any or all of a child’s sense of sight, smell, taste, hearing and touch. Experts agree that by providing young children with opportunities to explore different mediums and experiences, we help them develop and refine a whole host of skills – cognitive, social, emotional, physical, creative and linguistic. This DIY sorter targets the sight and touch senses – helping your tots with fine motor skills development, specifically their hand-eye coordination, as well as their language skills, and recognition of shapes, colors and textures. Glass bowls (2 bowls for each pasta type) (Glass would be best so that little ones can see the colors through the bowls. (And glass won’t absorb the dye). Just be careful if little hands are helping you mix – we don’t want any shattered bowls)! Step 1: Pour pastas into the bowls. The quantity is entirely up to you, but make sure that each type of pasta is poured into two different bowls. TIP: if your toddler is a pick-up and throw type, and you want to save yourself from a big pasta mess down the line, I would suggest that you make a small amount to start with. Or, alternatively, you can make the entire bags/boxes of pastas and only give limited quantities to your toddler each time they play. Step 2: Add different food coloring colors to the different bowls. Make sure that no two bowls containing the same kind of pasta are dyed the same color. You can adjust color shades by adding more or less of the color to each bowl. Step 3: Once the color absorbs and starts to dry, pour out the pastas onto aluminum foil and spread in a single layer. Let dry completely. Step 4: When dry, mix the pastas together and your sorter is complete! 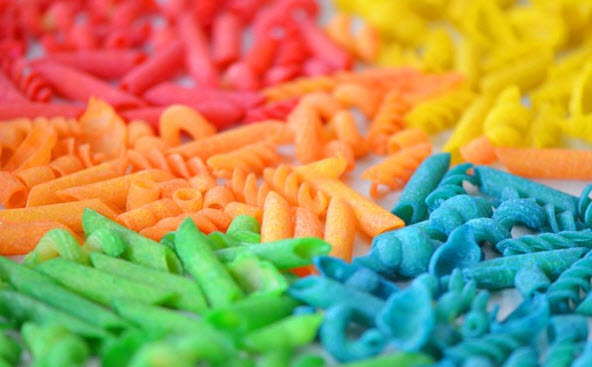 There are two ways to play – the pastas can be sorted by color, or by shape/type of pasta. Have your toddler separate the pastas and place them in the plastic containers. TIP: if separating by color, get plastic containers in the same colors that you dyed your pastas. The containers will serve as visual cues for your toddler and can help them sort the colors and match them to the appropriate containers. The cool thing about this DIY is that parents can make the sorter with their toddlers. Pouring the different pastas into the bowls, adding food coloring, stirring up the mixtures and waiting for the color to dry are all sensory learning experiences in and of themselves. Your toddler(s) will love partaking in the process of making this, and then will enjoy reaping the fruits of their labor when it’s time to play. It’s a win-win.